UCAN provides many assistance programs to improve the quality of life of Urbandale Residents. UCAN seeks to offer a number of programs that assist Urbandale residents that are in need. 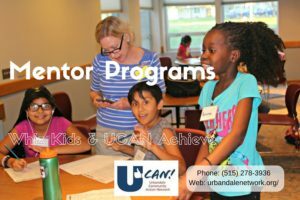 In offering these programs, UCAN hopes to replace despair with opportunity and hope by focusing on individuals, families, communities and facilitate problem solving. Click on a link below for more information about a program and how to apply! If you aren’t certain which program might best serve your particular need or situation, please call us at (515) 278-3936 and someone will be happy to assist you.